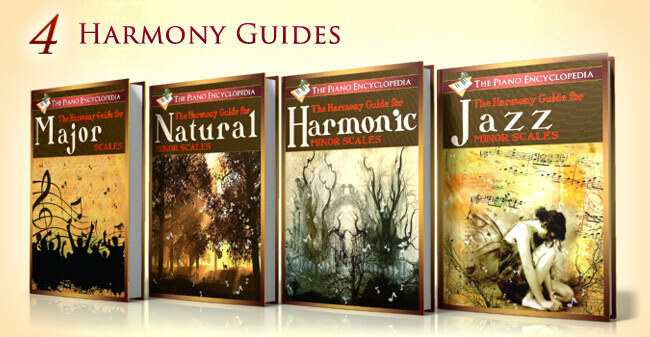 The Harmony Guides are four separate interactive books that will help you harmonize all the scales used in western music so you can easily improvise and create your own music by following the suggested chords and scales. These guides contain more than 280 pages of content, with more than 1000 interactive animations! Major Scales Harmony Guide – This book deals with all of the scales in the Major keys. This will be very useful when you want to create cheerful, uplifting music. Natural Minor Scales Harmony Guide – When you are looking to create songs that are more melancholy, dark, or strangely romantic, this is the book for you. Jazz Minor Scales Harmony Guide – From its very beginnings with the slaves until now, Jazz music has a certain sound that resonates with people and helps stir their emotions. This book will help you understand the specific scales mainly used in Jazz and Blues. Harmonic Minor Scales Harmony Guide – Have you ever watched a horror movie and paid attention to the music in the background? The arrangement of the music gives a creepy feeling to the scene which adds so much to the experience. In this book you will see how to work with the different scales to compose music that is definitely out of the ordinary. So how do these books work? It’s very simple. 1. You pick the scale that you want to use. 2. The book tells you which keys to play, and which keys not to play, to create your new melody. 3. Once you have the new melody, the book tells you the chords to use to accompany your melody. 4. You play your new composition. We know that you will find these products to be very useful. We are happy to be able to give you even more tools to help you create the sound that you are looking for. Enjoy!